This is the only time that we intend to quote a second-hand version. Wanted: Ilyumzhinov’s own words on the subject, whether in writings, speeches or interviews, and preferably in the original language. Can readers help us to build up a file of exact quotes and references? ‘It happened on 17 September, I remember, in Moscow; it happened in my apartment. They are people like us. They have the same mind, the same vision. I talked with them. I understand we are not alone in this whole world. We are not unique. Meet the President – Kalmykia – 16 July 2007 – Part 1. Meet the President – Kalmykia – 16 July 2007 – Part 2. The sequence in question comes at the start of Part 2. The interview, conducted by Jonah Hull, is also available on the Al Jazeera website. We are grateful to Dan Scoones (Coquitlam, BC, Canada), who has provided a comprehensive digest of the FIDE President’s declarations on the subject. The translations of the Radio Freedom interview and the Posner interview are by Mr Scoones. Excerpt from the transcript of an interview with Kirsan Ilyumzhinov on Radio Freedom (Czech Republic) in 2001. ‘Fleming Rose: It is well known that you are a master of the PR action – the publicity stunt. However, the time for publicity stunts is probably over. You have already managed to take a few actions that have put Kalmykia on the front pages of the global media. Nevertheless ... are you planning to do something else in the near future? Kirsan Ilyumzhinov: As far as PR is concerned ... I do not have a Head of PR, or a PR agency. I do not engage in PR at all. I do not think about what word to use, or whether to throw out a facetious remark in the manner of Ostap Bender. Life itself is probably public relations. The main thing is that I have one guiding principle: work, work, and more work! In 1989 I graduated from the Institute. In 1993 I was elected President, and since then I have not had one free day, or one worker’s vacation. Fleming Rose: Nevertheless I have heard that you are planning to come out with a new PR action in the Autumn of this year. Is it possible that it will involve your desire to take a trip into outer space? Kirsan Ilyumzhinov: No. Well, probably, the Autumn is connected with Ostap Bender. In the Autumn of this year we shall have many projects and actions: the World Youth Olympiad in Brazil, and the FIDE General Assembly in Greece. Perhaps it will be a decree about a passport system for the Kalmyk people. Perhaps it will be the creation of a Kalmykian Khanate. I don’t know what or how – so far we have not had any thoughts along these lines. But if it is a declaration about the creation of a Kalmykian Khanate, then that means it is the next PR action, the next publicity stunt. Fleming Rose: But have you taken a flight into outer space? Kirsan Ilyumzhinov: We have our own planet, and it was Ostap Bender’s idea to establish intergalactic competitions, but, speaking frankly, there is no time right now for going into outer space. I did this once already, in September or October 1997. This has already happened. But once was enough. True, it was not in our Russian space vehicles, but with aliens. They took me on a trip into outer space. Fleming Rose: Who took you? Kirsan Ilyumzhinov: They came in a flying saucer, picked me up, and I spent a whole day in outer space. Karen Agamirov: Have you written anything about this? Kirsan Ilyumzhinov: No, not yet. Well, I think that people would have simply taken me for a madman. When the time comes, I shall write about it. Ilya Kolosov: Is this a publicity stunt, or are you speaking the truth? Kirsan Ilyumzhinov: The truth, of course. I think that this year my book may be published, and it is possible that I shall describe this incident there. Perhaps I was sleeping, or not sleeping. We are having a frank conversation right now. I am saying that people fly while they are dreaming, but I was flying, and was in outer space, and was describing everything, and as far as I could tell I was awake. I saw everything clearly and precisely. Karen Agamirov: But in advance of your book coming out, can you share with us who this was? Kirsan Ilyumzhinov: It was from my apartment. They flew in and picked me up. They were wearing yellow spacesuits. I remember this moment exactly. We went off to their interplanetary ship, and I started to feel a lack of air, a lack of oxygen. They gave me a spacesuit as well. I did not have time to think that there wasn’t enough air, when one of my companions – I don’t know what to call him – one of the aliens – pointed to his chest and indicated that the oxygen supply could be regulated by turning a dial. So this is what I did. And the most interesting thing was that they appeared not to pay any attention to me. I did not understand their purpose in picking me up. That is, they did not take me on their interplanetary ship for any special purpose – they just showed it to me. The ship was absolutely enormous. One of its chambers was the size of a large football pitch. There was lighting. We landed on one of the planets and picked up some piece of equipment. And they told me everything in detail, the ones who transported me explained things, either the captain of the ship or someone else. I remember that I asked them to take me back to Earth as quickly as possible. Why? Because in two days I had to conduct Youth Government Week, and I repeated this request several times. And then they brought me back, and everything was normal again. Fleming Rose: In what year was this? Kirsan Ilyumzhinov: It was in 1997, at the end of September. Karen Agamirov: And who were these aliens? What did they look like? Kirsan Ilyumzhinov: Well, like people, that’s what they looked like. Karen Agamirov: Healthy, about two metres tall, as they are often described. Kirsan Ilyumzhinov: Not quite. Please don’t take me for a schizophrenic. I am just saying that I saw them. Normally, as it is with us right now – that’s how I saw them. I then I described what I saw. My two assistants noticed this – they said, “Where did you disappear to?” It was in the evening. My body went away and then came back. But I have described everything, and my two assistants had taken note of my absence. Karen Agamirov: There is actually nothing all that strange here. You are not alone in this, and you are not the first one to make such a report. Did they leave you any parting words? Did they program you for anything further? ‘Флеминг Розе: ... Известно, что вы мастер пиаровских акций. Но время пиаровских акций, наверное, закончилось. Вам уже удалось несколько раз сделать так, чтобы Калмыкия оказалась на первых полосах мировой печати. А все-таки, по сути, что вы собираетесь делать? Кирсан Илюмжинов: Что касается пиара. У меня нет ни начальника по пиару, нет ни пиаровской службы. Вообще, я не занимаюсь пиаром. Я не думаю – какое слово сказать или какую, там, шуточку запустить по Остапу Бендеру. Наверное, сама жизнь и есть пиар. А самое главное, у меня один принцип – это работать, работать и работать! Я в 1989 году закончил институт. В 1993 году избрался президентом, и у меня еще не было ни одного выходного дня, ни одного отпуска трудового, рабочего отпуска. Флеминг Розе: Но, тем не менее, я слышал, что вы собираетесь обнародовать очередную акцию осенью этого года. Может быть, это будет связано с тем, что вы хотите полететь в космос? Кирсан Илюмжинов: Нет. Ну, наверное, осенью это связано с Остапом Бендером. Осенью у нас очень много мероприятий: всемирную детскую олимпиаду мы проводим в Бразилии и генеральную ассамблею в Греции проводим. Может быть, это указ о паспортизации калмыцких родов. Может быть, это создание калмыцкого ханства. Я не знаю, что и как, мы пока на эту тему не думали. Но если будет заявление о создании калмыцкого ханства, то значит это очередной пиар. Флеминг Розе: А полетели в космос? Кирсан Илюмжинов: Есть планета у нас, и была мысль Остапа Бендера провести межгалактические соревнования, но, честно говоря, сейчас времени нет – в космос. Один раз я летал уже, в сентябре или в октябре 1997 года. Это уже было. Ну, это одного раза достаточно. Правда, не нашими российскими космическими кораблями, а с инопланетянами. Один раз забирали меня в космос. Кирсан Илюмжинов: Ну, вот на тарелке прилетели, забрали, и вот сутки находился я в космосе. Карэн Агамиров: А вы написали об этом? Кирсан Илюмжинов: Нет, еще не написал. Ну, я думаю, что просто за сумасшедшего приняли. Придет время – напишем. Илья Колосов: Пиар-акция, или вы говорите правду? Кирсан Илюмжинов: Да нет. Я думаю, что, может быть, в этом году выйдет книга моя, и там, возможно, я опишу этот момент. Может быть, я спал, не спал ... У нас беседа откровенная. Я говорю, люди во сне летают, и я вот летал, был в космосе, и все описал, как будто наяву, все четко, что я там видел. Карэн Агамиров: Но до выхода книги хоть поделитесь с нами, кто это был? Кирсан Илюмжинов: Из моей квартиры ... Прилетели, забрали. Были в желтых скафандрах. Я такой момент помню – мы зашли на космический корабль, и воздуха, кислорода стало не хватать. Мне тоже дали скафандр, и я не успел подумать, что воздуха не хватает, но товарищ – я не знаю, как его назвать, – инопланетянин показал на грудь: здесь вот покрути немного, ну, отрегулируй кислород. Отрегулировал. И что самое интересное, меня как бы не замечали. Я не понял, для чего меня взяли. То есть не водили специально по космическому кораблю, там, показывали. Корабль был громаднейшим. Там одна из кают была в большое футбольное поле. Иллюминаторы были. И мы опустились на одну из планет, взяли какое-то оборудование. И все мне подробно рассказывали, объясняли те, кто меня водил, капитан корабля или кто. Я помню, что просил быстрее меня вернуть на землю. Почему? Потому что я через два дня должен был проводить неделю молодежного самоуправления в Калмыкии, и я несколько раз обращался с этой просьбой. Но потом меня обратно привезли, и дальше все нормально было. Флеминг Розе: Это в каком году было? Кирсан Илюмжинов: Это в 1997 году, в конце сентября. Карэн Агамиров: А инопланетяне кто? Как они выглядели? Кирсан Илюмжинов: Ну, как человеки, – вот так вот выглядели. Карэн Агамиров: Здоровые, по 2 метра, как их описывают часто. Кирсан Илюмжинов: Да нет. Не воспринимайте меня как шизофреника. Я просто говорю, что видел их. Нормально, как мы с вами общаемся, так вот я и видел. И потом я это изложил. Это заметили два моих помощника: ты куда пропадал? Это было вечером. Тело мое ушло и потом пришло обратно. Но я все описал, и два моих помощника заметили мое отсутствие. Карэн Агамиров: А на самом деле ничего такого странного тут нет. Это же не вы один. Не вы первый, кто об этом рассказывает. А они вам какие-то напутствия давали? Программировали на дальнейшее? Кирсан Илюмжинов: Нет. Ничего. Я так и не понял, потом несколько дней ходил и думал: для чего меня забрали? И я себя ругал, что вопросы им не задал ... Но, может быть, еще не время, чтобы эти внеземные цивилизации встречались. Кстати, я в своей книге отвечаю на вопрос, нужно ли нам сейчас встречаться, я считаю, что не нужно. В нравственном плане мы еще не дошли до уровня, когда мы можем встретиться с этими цивилизациями, с пришельцами. Excerpt from an interview with Kirsan Ilyumzhinov by Michael Specter of the New Yorker, 24 April 2006. Excerpt from an interview with Kirsan Ilyumzhinov by Vladimir Posner on 1TV (Russia), 26 April 2010. ‘VP: Welcome to the programme Posner. 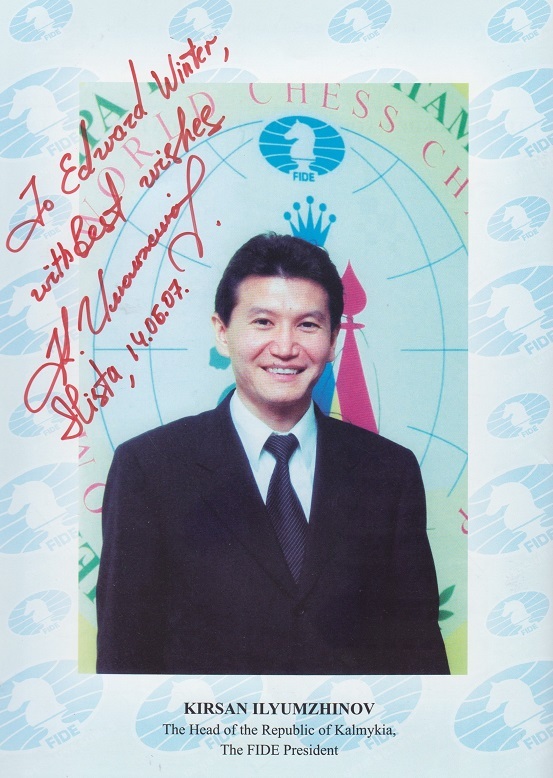 Our guest today is the head of the Republic of Kalmykia and President of FIDE, Kirsan Nikolaevich Ilyumzhinov. Hello. KI: Good evening, Vladimir Vladimirovich. VP: You know, in the course of my long life I have met many, many people. But I have never met anyone who said that he had been on an interplanetary spaceship with aliens, as you have said. According to your account, this happened in April of 1997 – is that right? KI: A small correction: on 18 September 1997. VP: Ah, September, pardon me. But this actually happened? KI: Well, seriously, yes, it did happen. VP: Only seriously, of course. KI: Yes, of course. This is a serious broadcast. Of course it happened, I cannot deny it. I have told of it several times in interviews, even to BBC Television, which was in 1998. VP: There were no repeats – no other incidents? KI: No, there were no repeats. But it did happen, and how does one relate to this? Possibly with some irony. But on the other hand, I believe that I saw them and interacted with them. VP: Tell us a little bit about how this happened. ‘В.ПОЗНЕР: В эфире программа “Познер”, гость программы сегодня – глава Республики Калмыкия, президент ФИДЕ Кирсан Николаевич Илюмжинов. Здравствуйте. КИРСАН ИЛЮМЖИНОВ: глава Республики Калмыкия, президент ФИДЕ:Добрый вечер, Владимир Владимирович. В.ПОЗНЕР: Знаете, я за свою довольно долгую жизнь встречал множество людей. Но я никогда не встречал человека, который сам говорил, что он побывал на межкосмическом, межпланетном корабле с инопланетянами, как говорили вы. Причем случилось это, по вашим словам, в апреле 1997 года. Правильно, да? К.ИЛЮМЖИНОВ: Немного поправлю: 18 сентября 1997 года. В.ПОЗНЕР: А, сентябрь, простите. Но это действительно случилось? К.ИЛЮМЖИНОВ: Ну, если серьезно, да, это было. К.ИЛЮМЖИНОВ: Да, конечно. Передача серьезная. Конечно, это было, я это не отрицаю, это давал несколько раз в интервью даже телеканалу “Би-би-си”, это было в 1998 году. К.ИЛЮМЖИНОВ: Нет, повторов не было. Но такое случилось, и как к этому относиться? Можно и с иронией. Но, с другой стороны, я верю в это, я с ними общался, видел. В.ПОЗНЕР: Расскажите чуть-чуть о том, как это было. Excerpt from an interview with Ilyumzhinov by the Russian news site gazeta.ru in 2010. ‘gazeta.ru: The readers of gazeta.ru have been asking a lot of questions in respect of your conversation with V. Posner at the first channel of Russian TV, especially the part which was devoted to your encounter with extraterrestrials, and which has caused so much interest. Our readers were bewildered by this part and they have a lot of questions. Could you give them any kind of reply now? Excerpt from a gazeta.ru interview with Kirsan Ilyumzhinov, 2010. ‘Some laugh when they hear your stories about aliens. Has anyone famous told you something similar? I was also interested – what exactly? Smyslov said: “I’ve been silent for 30 years. A professor, a world champion – I was afraid to be considered a madman”. It turns out that in 1974 Vassily Vassilievich had contact with aliens. His wife is a witness. He was playing a Candidates’ match with Hübner and fell ill. The game was adjourned and he returned to his hotel. He hadn’t managed to turn on the light when someone set up the position for him, and began to tell him how to play. The next morning Smyslov made those moves – and won. A day later it all happened again. And he didn’t reveal it to anyone? At some point he felt bad and thought he was dying – and he wrote an article about it for the journal “Science and Religion”. But when he got better he was embarrassed to send it. I don’t know if it’s been preserved. You’ve often talked about one meeting with aliens. Was there nothing else after that? ‘Некоторые смеются, слушая ваши истории про инопланетян. А кто-то из известных людей рассказывал вам похожее? – Вот и мне стало интересно – что такое? Смыслов сказал: “Я молчал тридцать лет. Профессор, чемпион мира – боялся, что сочтут сумасшедшим.” Оказалось, в 1974 году у Василия Васильевича был контакт с инопланетянами. Жена – свидетель. Играл матч претендентов с Хюбнером и заболел. Партию отложил, вернулся в гостиницу. Не успел зажечь свет, кто-то расставил ему позицию. Начал рассказывать, как играть. Наутро Смыслов воспроизвел эти ходы – и победил. Через день все повторилось. – И никому не открылся? – В какой-то момент ему стало плохо, думал, что умирает – и написал об этом статью в журнал “Наука и религия”. Но когда выздоровел – постеснялся отсылать. Не знаю, сохранилась ли. – Про один свой контакт с инопланетянами вы часто рассказывали. После ничего не было? Interview with Ilyumzhinov by Shaun Walker of the Independent (United Kingdom), 22 September 2010. Interview with Kirsan Ilyumzhinov by Dylan Loeb McClain, New York Times, 18 November 2010. ‘In the Western press, there are often derisive comments about you because of your beliefs about alien abductions. Will you continue to talk about this belief? Or do you have any plans to stop? KI: Many in this world believe in God although it would seem that no one has yet seen him. Many people also believe in the existence of extraterrestrials, and I am one of them. But my faith is underscored by the experience of humanity. It is no coincidence that every year NASA registers over 4,000 contacts with extraterrestrial civilizations. I have decided to write a book about my contact with extraterrestrials, and it will be published in the United States in 2011. In it, I will speak of my personal experience communicating with extraterrestrials and my view on the question of extraterrestrial civilizations. NYT: You have recently stated that chess was given to Earthlings from extraterrestrial visitors. 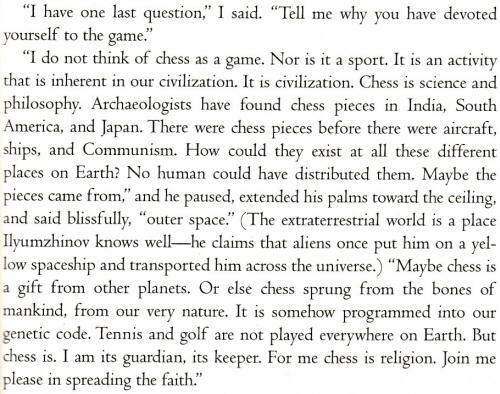 How did you come to believe this theory about the origins of chess? Addition on 10 August 2014: a further video interview. Pages 50-52 of the September 2015 issue of ForteanTimes contain, as Alan O’Brien (Mitcham, England) has informed us, an article by S.D. Tucker entitled ‘A Pawn in the Game’. 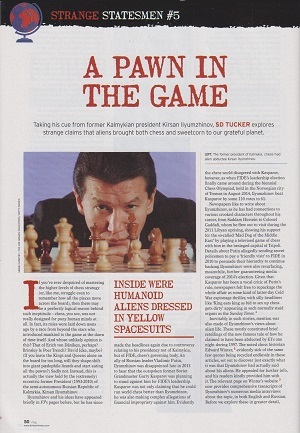 It quotes many of the FIDE President’s statements, with due credit to our feature article Kirsan Ilyumzhinov and Aliens. Addition: an article dated 29 September 2015 on the ‘Kirsan Ilyumzhinov Information Portal’. Latest update: 10 April 2017. Another feature article: Garry Kasparov and New Chronology.